Greetings from New York! 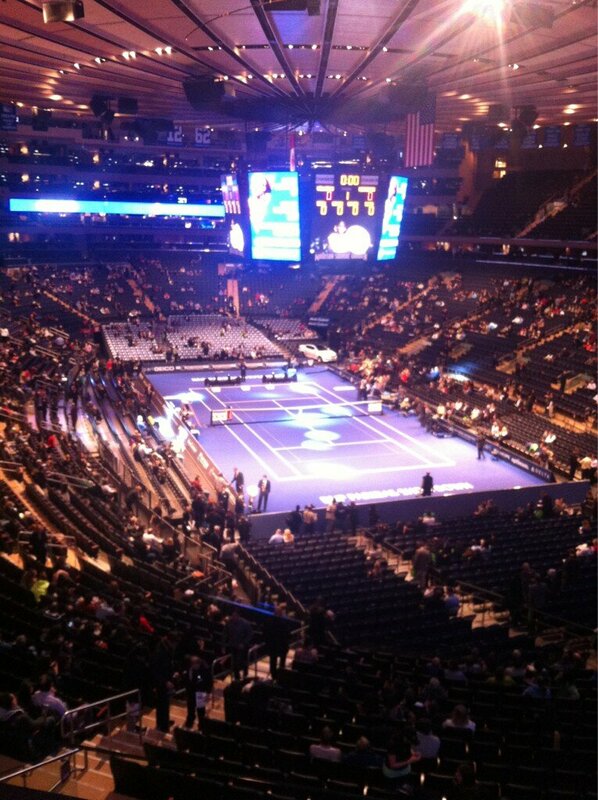 I made the trip up from Philadelphia, and have been crashing with Lindsay to cover the BNP Paribas Madison Square Garden exhibition with Rafael Nadal, Juan Martin del Potro, Serena Williams, and Victoria Azarenka. I even managed to ride the subway by myself without ending up on Coney Island accidentally, so the trip has been a success so far! As a fan of the Philadelphia Flyers, walking into Madison Square Garden feels like entering enemy territory (it’s where the New York Rangers play). 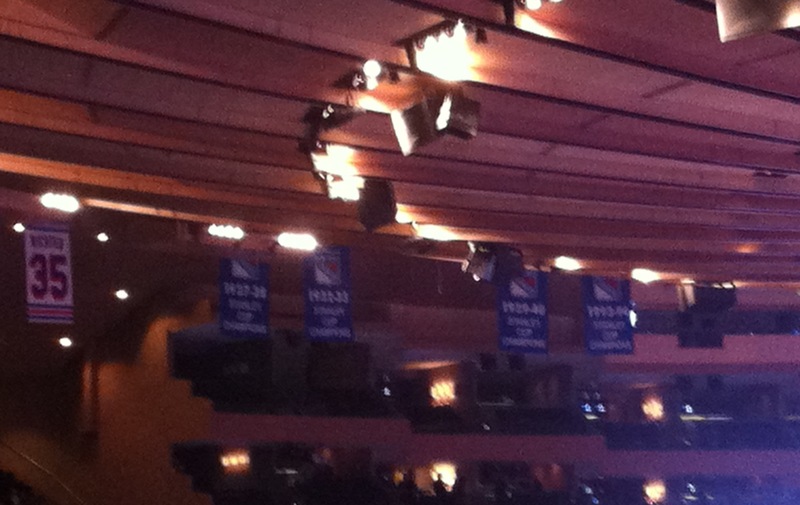 I have to get over my skin-crawling reaction to seeing these banners hanging from the rafters! This morning, Lindsay and I attended a press conference with all the players. As expected, the vast majority of questions were to Rafa about his knee. Delpo said about five words. Anyway, throughout tonight’s exhibition, I’ll be updating this liveblog with my thoughts from the press box, with an assist from Lindsay. 7:17 p.m. – Vika comes out. No hoodie over her head! And I haven’t seen Redfoo yet, but I have been advised that he’s in the vicinity, so I’ll be keeping a lookout. Delpo comes out, dressed in a polo shirt and jeans. I guess the ladies are up first, unless this is Delpo’s new Nike kit. The packed house goes absolutely insane as Rafa comes out in neon-colored Nike gear. 7:35 p.m. – Redfoo alert! I look around the arena for all of two seconds before spotting Redfoo engulfed in neon green, carrying a tennis racquet for some reason. He is courtside, of course. 7:41 p.m. – Serena opens with a break, but Vika breaks back straight away. The crowd is not pleased with that turn of events. Last year Caro dragged Rory onto court to play a few points against Maria. RedFoo is courtside with his racket, so watch out Serena! 7:50 p.m. – The crowd gives Vika her first begrudging ovation as she saves break point with stellar net skills. But Serena breaks on her second try. Meanwhile, the TV cameras have found Redfoo. He stands up and does some form of “dancing” to the Party Rock Anthem in the changeover. The tennis world cringes watching at home, I assume. I’m not sure the crowd here knew what was going on, which is definitely for the best. Sitting this far away in this dimly lit exo is a stark reminder of how much I need glasses. Pretty much all I can see is RedFoo. Serena just hit the saddest drop shot attempt in the history of the world. I would have laughed out loud in the press box. 8:11 p.m. – Serena takes the first set, 6-4. She’s playing a lot better than she usually does in exos. Maybe she’s enjoying the home crowd support/Vika effect. @amyfetherolf Oh no, not the children, we must protect the children! 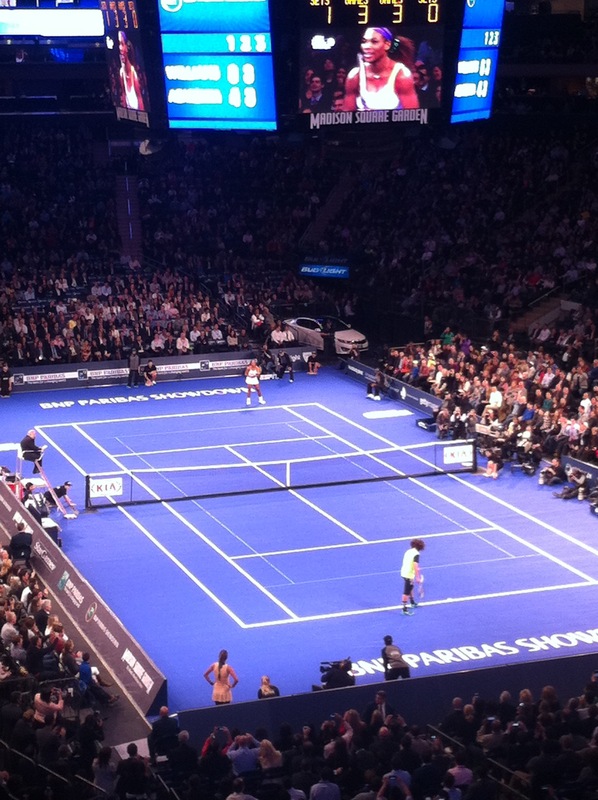 8:35 p.m. – Redfoo has taken the court, because we knew he would. His form is a bit better than Rory’s, but he is a tennis coach, after all. After he exits the court, Vika and Serena play a little bit left-handed. They do pretty well! 8:53 p.m. – Serena takes the set 6-3, and the match. Vika says she and Serena are about to come out with a karaoke duet, Vika playing piano and Serena singing “Stay” by Rihanna. When asked about rumors that Rafa is being paid 1.5 million to play the MSG exhibition, Serena jokingly says she’s getting paid 3 million, and that Vika’s getting 3.5. 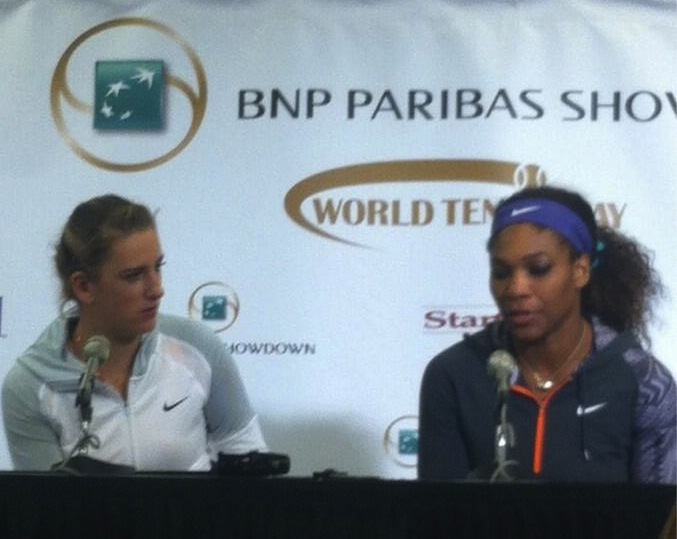 “There’s just a few people who I would really associate with.” -Serena on Vika, apparently saying she’s one of them, I think. Meanwhile, Delpo and Rafa are on court already, having already played (just?) four games. At the pace these two play, I must’ve missed at least an hour of the match. Nadal should aim one of his overheads at the fan in the front row taking pictures on an iPad. Delpo watching highlights of his US Open title on the jumbotron during changeover, nods in approval. Someone just yelled “Vamos Rafa” in such a hoarse voice that I could swear it’s JJ in the nosebleeds. 10:20 p.m. – Delpo takes the first set in a tiebreak. Partying like it’s 2009. He has to be enjoying all the clips of himself winning the US Open that keep playing on the big screen. Delpo takes the match, 7-6(4), 6-4. Some nice shotmaking from both guys, and it was great to see Rafa having fun playing on a hard court. The crowd was pumped to see Rafa, after such a long period of being deprived of his talents, and the match didn’t disappoint. With that, I will bid you farewell from New York. Thanks for following along! really number 1 and number 2 or actually 2 number ones:) can we see you guys hold? I’m liking Azarenka’s finesse so far! 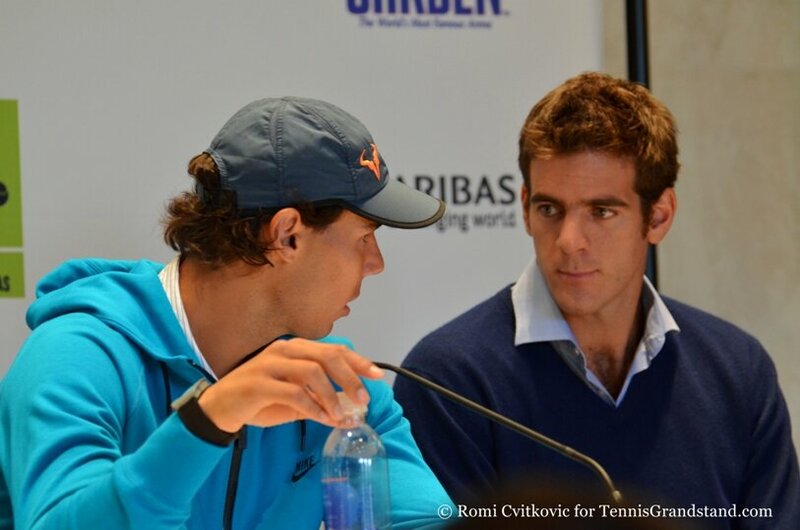 Delpo and Rafa are such nice guys, looks like they gave NY a show worth their money. That little girl was very lucky, got a hug from Juan and a kiss from Rafa-I’m jealous to say the least haha! It was so great to see Rafa having so much fun on the court. He has such a beautiful smile. That little girl was terrific! What an experience for her. The winner of the exo was the girl playing doubles with Del Potro. By the way, are you hanging around to watch the Flyers vs Rangers tonight? I wish I were, but I had to head back to Philly! Are you a hockey fan? Generally, I am a sports fan and I do watch my share of hockey. I am planning on watching the Flyers and Rangers on NBC Sports Network this evening while looking at the ATP and WTA draws from Indian Wells. Speaking of Indian Wells, guess the podcast will cover both draws at once.